Photograph courtesy of Talya Arbisser, copyright 2013, used with permission. We stand at the threshold of a Great Turning where a healthy future depends on the ability for human societies to recognize the power of the village and the centrality of intergenerational community to planetary prosperity. Weaving the Generations furthers the paradigm shift of Jewish Renewal with a village-building ethos that honors the essential gifts of each generation, connects the generations with collaborative relationship-building opportunities, and empowers the growth of vibrant, intergenerational Jewish life. For the past year, a group of committed individuals, representing many different ages and stages of life, have been meeting intermittently to discuss the future of the Jewish Renewal movement.These persons included: ALEPH Executive Director Joe Laur and Jewish Renewal teachers and change agents Rabbi Shefa Gold, Mia Miriam Cohen, Amitai Gross, Rabbi Burt Jacobson, Eva Neuhaus, Adam Segulah Sher, Rabbi Jeremy Parnes, Jade Netanya, Sarah Rohr, Sarai Shapiro, Shir Yaakov Feit, Rabbi Marcia Prager, Gavriel Strauss, and Wilderness Torah Founding Director Zelig Golden. These meetings have helped to address the urgent need for outreach to and accommodation of all ages and implementing a fresh paradigm of thinking that weaves the generations through a culture of mentorship and intergenerational connections. 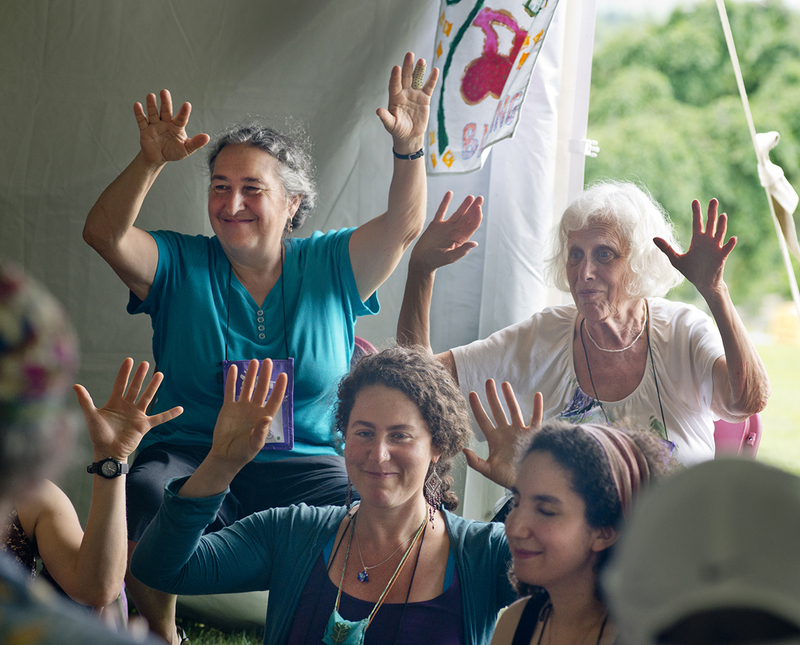 Initiate a new conversation with Jewish Renewal communities about Weaving the Generations. Connect elder and younger leaders to cultivate mentoring relationships. Honor the rites of passage of our youth in the custom of our Jewish Renewal communities, in turn inspiring them to become more a part of the Jewish Renewal Community. Provide leadership opportunities to up-and-coming leaders. Provide outreach to young and unaffiliated adults with the message of a renewed Judaism that is dedicated to joy, love, serious engagement with Jewish tradition, and Tikkun Olam. At the recent Kallah in Rindge, NH, several events helped the community to introduce, gain support and kickoff this bold new initiative. An opening ritual focused on honoring the wisdom of the elders was held on Tuesday, on Wednesday the focus shifted to the youngers in an event facilitated by Rabbi Shefa Gold and Gavriel Strauss. Children and teens were ritually sent off on rite-of-passage camping trips. On Thursday, Mia Cohen and Zelig Golden led a workshop about shifting the paradigm by fostering communication and mentoring between elders and youngers. On Friday the children and teens were welcomed home with a “Wrapping the Bundle” ceremony, and on Shabbat one of the morning davennen sessions, led by Rabbi Shawn Zevit, Mia Cohen, Eva Neuhaus and Mitch Gordon, focused on intergenerational themes. Posted in ALEPH Kallah. Bookmark the permalink. Bravi, so wonderful to hear about the community-wide launch of this important initiative. Thank you all for taking these first, awesome steps.